This report explores the work of the Bahraini Ministry of Interior Ombudsman and the Bahrain National Institute for Human Rights, measuring their progress as human rights institutions and their ability to defend human rights in Bahrain. The report evaluates both institutions based on information publicly provided by both offices and taken directly from victims on the ground, as well as in the context of human rights developments in the country. The Bahraini government established the Office of the Ombudsman – Ministry of the Interior (MOI) on 28 February 2012 as part of a goal to achieve political and institutional reform and to promote human rights. The Ombudsman is responsible for ensuring that employees of the Bahraini MOI interact with the public in a manner that is respectful of human rights. In addition to well-established international norms, these responsibilities are governed by three sets of standards, set forth by the Bahrain Independent Commission of Inquiry, the International Ombudsman Institute, and the Ombudsman’s self-reported standards. These self-reported standards can be found in the Ombudsman’s “First Annual Report” published in 2014. The Ombudsman has failed to meet most of these standards. Most significantly, the Office fails to meet international guidelines by lacking independence from the Bahraini Ministry of Interior. According to the mandate of the Ombudsman and the self-reported guidelines as described by the Ombudsman’s report, the Ombudsman is obligated to discharge his duties in a manner that reflects well upon the Ministry of the Interior and does not undermine the credulity of the Ministry in the eyes of the public. Additionally, the Ministry of Interior has the power to halt Ombudsman public investigations by initiating internal, private investigations handled by the MOI Special Investigations Unit. The ability of the Office of the Ombudsman to effectively criticize Ministry of Interior policy and behavior is compromised by MOI oversight and control of the institution. The Ombudsman’s report failed to address key issues such as torture and arbitrary detention in Bahraini prisons. This failure occurs despite the Office having received numerous complaints detailing instances of arbitrary detention and torture, including complaints submitted by ADHRB. ADHRB’s own findings on the human rights of detainees in Bahrain reveals that many political prisoners complain of issues concerning torture, enforced disappearance, and arbitrary detention. The Ombudsman’s report does not comment on these issues. Additionally, even where the Ombudsman addresses issues related to his mandate, such as prison capacity, humane treatment and conditions, rights and guarantees, and healthcare, the Ombudsman fails to provide meaningful commentary. The Ombudsman also fails to properly engage in prison investigations in Bahrain. Although the Ombudsman promises to engage in a comprehensive prison review process, the Office has thus far only reviewed Jaw Prison, the primary detention center for convicted persons. The Office’s choice of its initial review is problematic; the vast majority of human rights violations occur prior to conviction as the government moves to secure confessions by any means possible, up to and including torture. Because of this, the largest proportion of human rights violations occur in nearly every other detention center besides Jaw Prison. As a result of the report failing to mention the substantial issues of torture, arbitrary detention, and enforced disappearance, and also focusing on the post-conviction (Jaw) prison, the Ombudsman’s report effectively masks substantial human rights concerns critical to his mandate. Additionally, the Ombudsman’s Office suffers from a lack of independence regarding its personnel. The Secretary General of the Ombudsman, Nawaf al-Moawda, is connected to departments within the Bahraini government that the Ombudsman is charged with monitoring. This is particularly concerning in light of Mr. al-Moawda’s previous employment in the public prosecutor’s office, which is implicated in many of the human rights abuses that his Office is now mandated to review. The Bahrain National Institute for Human Rights (B-NIHR) was established in 2009 by royal decree. Its activities are intended to fall in line with the ideals laid out in the Paris Principles, a set of guidelines developed by the United Nations (UN) to govern all National Human Rights Institutes (NHRI) around the world. According to the Principles, in order for such an organization to make progress in protecting human rights and thus fulfill its mandate, it must first establish firm independence from the government. Additionally, it must be transparent such that the public can hold it accountable and believe in its credibility. The personnel managing the activities within the institute must also be individually free from pressure and influence from the government. The UN awards accreditation to those institutes which comply with all of the Paris Principles and prove that they are independent, credible, and actually capable of carrying out activities and actions to protect human rights. The B-NIHR is not yet a successful human rights institute and has not yet obtained accreditation from the UN. First and foremost, the Institute is not independent from the Bahraini government. The B-NIHR maintains personnel who were or still are involved in the government in some capacity, including members formerly employed by the Ministry of the Interior and the Office of the Public Prosecutor. This alone compromises the independence of the B-NIHR. Beyond personnel issues, however, the B-NIHR also has significant structural problems in its mandate: the king takes personal responsibility for B-NIHR activities, as laid out in the organization’s constitution. This is a significant obstacle preventing the B-NIHR’s independence, because the king exercises control over the activities that the B-NIHR may attempt to carry out while additionally exercising similar levels of control over institutions the B-NIHR is meant to review. Additionally, the B-NIHR functions with a certain level of obfuscation in reporting its leadership composition and organizational activities to the international community; at the time of this writing, the B-NIHR had yet to release a public report on its activities in the five years of its existence. As a result of these combined factors, the B-NIHR suffers from an accountability problem; rather than holding the government accountable for human rights derogations, the government holds the B-NIHR accountable for its criticisms of the government. Because the B-NIHR has yet to release an annual report to the public, it is difficult to judge the B-NIHR on past action. However, because an NHRI in compliance with the Paris Principles is obligated to perform a number of activities in defense of human rights in its country, it is possible to grade the NHRI on its omissions in addition to its activities. Unfortunately, when examining the B-NIHR record, the Institute’s activities leave much to be desired. Since the establishment of the B-NIHR, ADHRB has cataloged multiple events in which the government took actions seriously detrimental to the status of human rights in the country and the B-NIHR either failed to act to prevent government action or explicitly endorsed the violation of human rights. In July 2013, for example, the Bahraini National Assembly passed a set of 22 recommendations which constitute serious violations of basic human rights. These recommendations banned all gatherings and sit-ins in the capital city of Manama, chiefly including peaceful political protests. On the day that the National Assembly endorsed the recommendations, the B-NIHR publicly praised the recommendations and stated that the recommendations would be consistent with Bahrain’s international human rights commitments. In the same statement, the B-NIHR called for the country to “stand behind the Kingdom’s wise leadership.” In a separate action, the government also passed additional legislation restricting discourse and dialogue between representatives of foreign governments and non-governmental actors, including members of the opposition. Not only did the B-NIHR remain silent while this legislation passed, but it has yet to come out against the legislation as a violation of human rights. Similarly, the B-NIHR has failed to condemn the ineffectiveness of the Office of the Ombudsman, or speak against government prosecution of political activists and peaceful protesters in a manner that violates their human rights. As a result, cases in which the B-NIHR criticized the government for acting to the detriment of human rights do not make themselves obvious. In summary, neither the Office of the Ombudsman of the Ministry of the Interior nor the Bahrain National Institute for Human Rights demonstrate the necessary independence from the government and have failed to take proper action in the face of human rights abuses to be considered functioning human rights institutions. 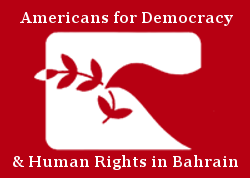 Instead, their close relationship with the Government of Bahrain combined with their record on human rights issues makes them not fit for purpose; far from displaying behavior characteristic of human rights defenders, the institutions appear more supportive of continuing the government status quo of restricting citizens’ human rights. Before these institutions can be taken seriously, they must improve their respective track records in addressing the human rights deficiencies in the country.